The subfloor is the foundation beneath finish flooring materials. On wood-frame floors, the subflooring provides a continuous structural surface over the floor joists. In basements and in homes with slab-on-grade foundations, the subfloor may simply be a concrete slab. Subflooring is a structural layer and should not be confused with underlayment or cementboard or tile backer, which create a layer between the subfloor and the finish flooring. Wood planks were the traditional subflooring material used in homes built up to the mid-twentieth century. Since then, planks have been almost entirely replaced by plywood and other sheet subflooring. The planks are typically 1x6 and made of pine, fir, or similar softwood. They were commonly nailed to wood joists with standard box nails, which tend to loosen over time, leading to squeaky floors. Planks nailed with ring-shank or fluted subflooring nails tend to squeak less because the nails resist pulling out. Many remodeled homes have wood plank subfloors covered with particleboard or hardboard underlayment to help bridge variations among the boards and create a flat surface for carpet and vinyl flooring. Plywood has been a standard subfloor material since the 1950s and remains the preferred subflooring for many builders. Standard plywood can be used for subfloors, but a better material is 3/4-inch tongue-and-groove plywood subflooring. The tounge-and-groove edges interlock to resist movement along the panel edges and create an overall stiffer floor. Quality installation of a plywood subfloor includes gluing the plywood panels to the floor joists with construction adhesive. The panels are also screwed to the joists or nailed with ring-shank or fluted subflooring nails. Plywood subflooring also comes in 1/2-inch and 5/8-inch thicknesses. Thinner subflooring may be suitable for carpet or resilient flooring, such as vinyl or linoleum, but thicker subflooring is recommended for nail-down hardwood and is required for floor tile. Oriented strandboard, or OSB, subflooring is similar to plywood subflooring and arguably just as common. It is installed the same way as plywood and offers similar performance, often for slightly lower cost. A concrete slab makes for a very hard, solid, durable, and often very smooth subfloor. Tile and stone flooring can be installed directly over concrete, but most other flooring materials require some kind of underlayment and/or a moisture barrier laid over the concrete. Concrete basement floors are susceptible to moisture, either from basement flooding or from ground moisture wicking up through the concrete (it's not impervious to water or water vapor), thus the need for a moisture barrier. However, even with a moisture barrier, solid hardwood flooring is not recommended over concrete subfloors in basements (or anywhere below grade). Other challenges with concrete are its coldness and hardness. It conducts cold from the ground below, and it's almost impossible to nail into. There are two methods for dealing with these issues. The traditional method is to fasten 2x4 "sleepers" to the concrete, then cover the sleepers with plywood subflooring. 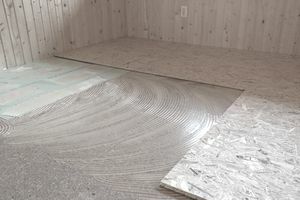 A newer, easier, method is to lay down a "floating" subfloor made with special tongue-and-groove panels of OSB adhered to a base layer of plastic or rigid foam insulation. The synthetic base separates the floor from concrete dampness (not floods or heavy water), and the OSB top creates a flat subfloor that can be nailed into or simply covered with a variety of flooring materials.